When she was growing up, the Literary Lady and her family would travel over the river and through the woods of New England to the home of Dr. Lawrence Wood to listen to a reading of Dickens’ A Christmas Carol. Dr. Wood, resplendent in his velvet smoking jacket and embroidered corduroy pants would greet the guests at the door, brandy in hand, and beckon them inside to begin his literary Christmas tradition. The chairs, pulled from every corner of the house, were arranged around his great chair and guests settled in, drinks in hand, to begin the long reading of Dickens’ tale. Dr. Wood, whetting his palate with brandy, would begin, his deep bass voice resonating through the living room saying, “Marley was dead: to begin with. There is no doubt whatever about that. The register of his burial was signed by the clergyman, the clerk, the undertaker, and the chief mourner. Scrooge signed it. And Scrooge’s name was good upon ‘Change, for anything he chose to put his hand to. Old Marley was as dead as a door-nail.” Alternating between published versions to best convey different scenes, Dr. Wood often would pass the book to fellow guests to share in the reading of the Christmas classic. This Christmas tradition, oh literary readers, takes quite some time. Children often fall asleep on their mother’s laps and teenagers offer up great sighs. Moods must be bolstered by wine, laughter (for A Christmas Carol is full of humor), and caroling. Mrs. Dr. Larry Wood is a great pianist, and guests are expected to carol heartily singing songs from the days of yore. Families would return year after year (if they were lucky enough to receive a treasured invitation) to bask in the Christmas warmth of the Wood home and to laugh at Dr. Wood’s impression of Old Fezziwig’s holiday festivities. Children have grown to be parents themselves and now bring their children to snooze through the long reading. With aplomb, a match would light, and the Smoking Bishop ignited with a glow of blue flames. “Oohs and Aahs” would tumble from the rapt audience. Still burning, Dr. Wood gently poured the Bishop into silver cups. Hot cider with cinnamon for the young ones (we were in puritanical New England after all) and the Bishop were passed to waiting hands. Each year, the hearty New England literarians repeat Tiny Tim’s famous words, “God Bless Us One and All” with arms raised before tasting the delicious beverage concluding a literary Christmas Tradition in New England. 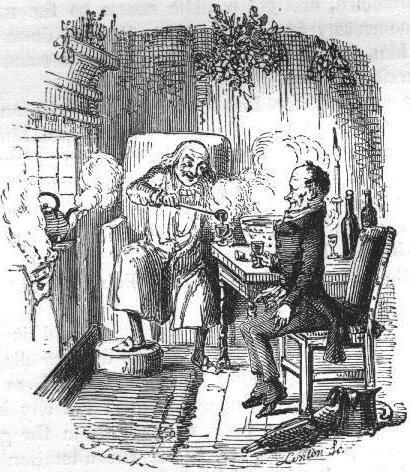 And so, if you are so inclined to attempt this literary tradition in your home, we have included a recipe for Smoking Bishop fresh from Dickens with an addendum from The Dark Horse Pub. This does not mention specifically how to make it flame; we suggest brandy, a box of matches, and patience. Take six Seville oranges and bake them in a moderate oven until pale brown. If you cannot procure any bitter Seville oranges, use four regular oranges and one large grapefruit. Prick each of the oranges with five whole cloves, put them into a warmed ceramic or glass vessel with one-quarter pound of sugar and a bottle of red wine, cover the vessel, and leave it in a warm place for 24 hours. Take the oranges out of the mixture, cut in half and squeeze the juice, then pour the juice back into the wine. Pour the mixture into a saucepan through a sieve, add a bottle of port, heat (without boiling), and serve in warmed glasses. Note: Paul McClowsky of The Dark Horse Inn in Philadelphia recommends bringing the mixture to a boil, then simmering for an hour, adding brandy, brown sugar and orange juice. Merry Christmas to all you literary men and ladies this season. May Santa bring you literary treasures and goodness from all the world over. 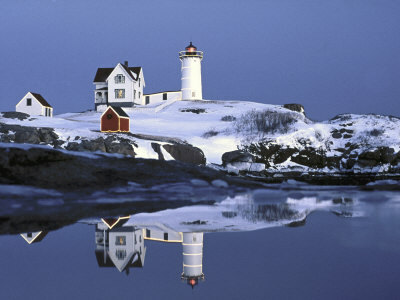  Archived in Book Recommendations, Literary Randomness. Bookmark the permalink.